Buy this magazine and read about the new pared down look for homes. Buy less but better quality clothes for your wardrobe. Buy this cookbook and learn how to cook from scratch instead of buying ready meals. Buy this amazing cosmetic and simplify your beauty routine. All of this is indicative of a desire for less stuff and a slower pace of life. Great. But hang on a minute... you don't have to buy simplicity, do you? Surely you can simplify without visiting an expensive department store. 1. Remove clutter from a room and give your favourite items more space to shine. 2. Reduce your wardrobe to your favourite items and wear them more often. Then celebrate your fabulous style. 3. Dust off your recipe books and experiment with a recipe you've never tried before. 4. Clear out your make up bag, wash your brushes and give yourself a different look. 5. Swap old magazines with a friend instead of buying new ones. OK, there's the possibility your home may feel a bit bare and your wardrobe a bit sparse but I bet you can live with less than you think. Ask yourself, “Is buying new simple stuff really going to simplify my life?” I suggest getting your possessions in order first, adjust to living with less and then consider your future purchases very carefully. We don't need to buy into this marketing trend for simplicity. Sorry, marketing people but I think we can sort out simple for ourselves without that over priced clean-lined sofa that you'd like us to buy. The real trend setters don't follow fashion and don't need to be told what to buy. In fact they don't buy much at all. Great style, whether it's in the home or in your wardrobe, evolves over time and comes from having the confidence to sometimes ignore fashion. I'd rather live with what I've got, consider my purchases carefully and spend my money (if I choose to) on experiences. And I've got better things to do with my spare time than shop. Yes! So very true. The marketing agencies have to follow trends, and make us want to buy into a lifestyle. Spend money to get the simple life, they say. I hate marketing, always have, but I'm probably a little susceptible to it myself. You've reminded me of this important lesson, that we can't buy simplicity - the simplicity is in getting rid of the unnecessary, not buying more. Great post Claire. Wonderful post Claire and I couldn't agree more! I've become very resistant to advertising ploys and fashion trends as I believe that true style and elegance is expressed by simple, clean lines. As you say, we don't need to buy more stuff to achieve this. I do like the idea of decluttering but I don't see the point of throwing away things I'll need to buy again in the near future, wasting money. I've never been a sheep, and like doing my own thing. I agree with you. Decluttering is a great idea but I've never understood why products sold to help you with it have to be so expensive. I'd rather throw things away than try to buy a special storage container for everything. Great post!! I couldn't agree more and with moving into a smaller place soon, I'm putting this into practice. Hi, I agree with all you have said here. I looked at a magazine in the supermarket with purported to encourage simple lifestyle choices but it was all full of adds and cost a lot.....I left it there . This sudden rush to get us to part with our money to live 'more simply' is ridiculous, I wonder how many folk have parted with their money, read the book or magazine and then had that sudden realisation that they were being told something they already knew and had spent hard earned cash to read it? I so agree with you! I am fairly new in the simplifying trend. I try to read a lot on the Internet, and have found many nice blogs on living simpler, but nearly each of the top blog writer has also written a book that is on sale. They don't organize a swap, or second hand sale... So you can have all their advices on how to simplify your life, the ones that did work for them if you buy their book... or their training... Great post and thanks for sharing your tips! I kind of agree with you. Ideas are a commodity now so common sense can beautifully photographed and sold back to us. Magazines are all about getting us to spend cash on things we don't need anyway (such as magazines) but I don't think simplicity is necessarily about making do. 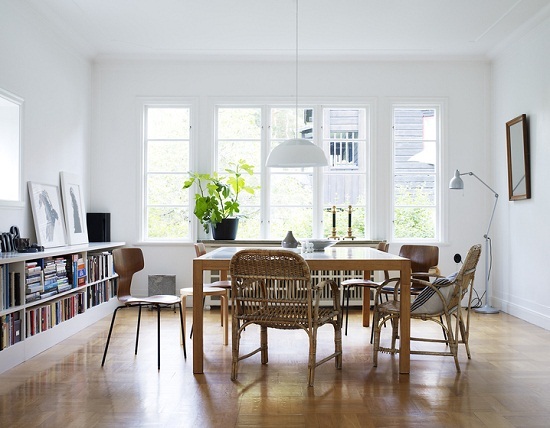 I do agree that the more you read magazines, with their many adverts, the more you'll see things you really like and can talk yourself into them being must-haves (I apply the same rule to pinterest - where every other chair is an Eames chair). Sometimes it's making do that's lead us to clumsy solutions in our homes and wardrobes in the first place. So a few choice items or alterations can make the home/wardrobe function far more efficiently than just a clear out and thinking that what already exists is appropriate. If we swallow everything without thinking about it then more fool us and if a fiver spent on a magazine provides inspiration for us to change forever then it's money well spent - it's all down to how much we choose to engage our brains or define ourselves by our stuff. I agree with you as your travel along the simplicity journey you realise the benefits and time are gained by not continually filling your homes with more stuff. Totally agree, I too will not part with my hard-earned cash for a few pretty pictures and a shed load of adverts. There is plenty enough inspiration in cyberspace to meet my needs. Well said! I agree - work with what you have, otherwise this simplicity/minimalism lark can get awfully expensive! YES! Buying more does not help one simplify.